Once you understand the need to track your income and expenses, the next logical question is: How? QuickBooks is the most popular software package for managing the finances of any small business. It works well for online stores. There are also many different ways you could enter online transactions into QuickBooks. For instance, should each sale be entered as an individual transaction? 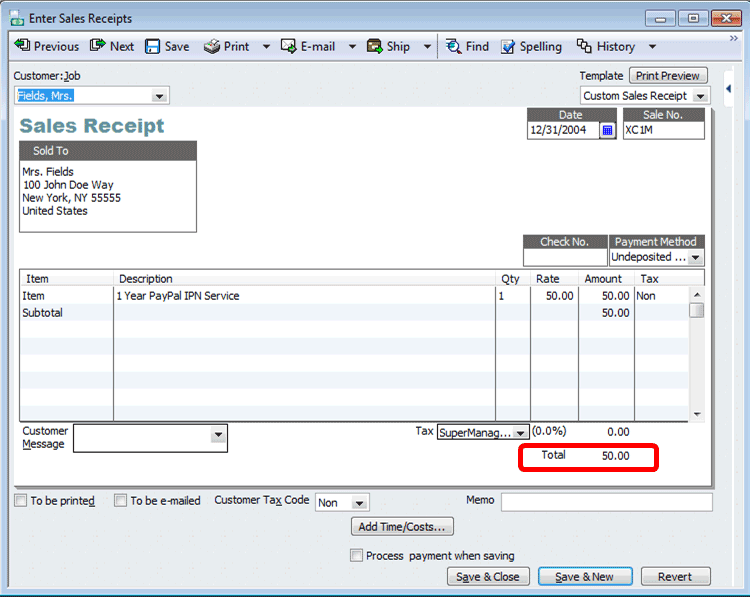 Should transactions be entered as sales receipts, invoices or sales orders? Should transactions be deposited directly into your bank account? The first question is partially a question of preference. Generally, online transactions are batched together by your merchant bank. Daily, weekly or at some other interval they add up all the money you have charged and credited to your customers and deposit them to your bank account. In order to have a transparent accounting of your bank account you will want to, at a minimum, create one transaction for each merchant batch. There are a couple of downsides of only tracking finances on the batch level. First of all, doing so requires you to determine how to link the merchant batch to your orders. This requires a great deal of diligence to make sure that you correctly split the amount charged to each customer for shipping, taxes, item sales and other categories. This becomes particularly difficult when more than one credit card transaction is used for one order. For example, if an item is backordered and therefore charged in two or more charges, or if a part of an order is returned, you need to track the amount of each of those charges/credits goes to each category. Using the batch method it is also more difficult to track inventory. The other most common way to enter financial information from your store into QuickBooks is to directly export each order. When you do this, you can more easily split out amounts going to each category since you simply create a line item in each order for each product and each service item (ex: shipping, taxes, etc…). You can also easily track inventory by creating your items as inventoried items and then referencing those items in your orders. The obvious downside of entering your financial information in this manner is the time it takes to enter each order into QuickBooks. Luckily there are tools available to help you in this effort. You can try The SuperManager free for 30 days. QuickBooks offers three different types of transactions: sales receipts, invoices and sales orders. Each of them has their appropriate use. The sales order is a little bit different than the other two. Sales orders are actually internal documents to your company that are intended to organize the work of preparing the products for sale. For this reason, they are what is called a non-posting transaction, meaning that in and of itself a sales order does not cause any money to transfer from your customer to you. Sales orders should generally not be used for online orders because in most instances there is little internal preparation required to fulfill an order and the transfer of money takes place soon after the time your customer places the order. Invoices and sales receipts are both posting transactions, meaning they do cause money to transfer from your customer to you. The distinguishing difference between the two is when the money changes hands. Invoices are intended to reflect that the products or services have been transfered to the customer and now they have some term in which they are required to issue payment. Depending on whether your company’s accounting is cash basis or accrual basis, it may or may not indicate that income has been received. If you are using cash basis accounting an invoice does not represent income since the payment has not been physically transferred from your customer to you. Before income is considered as received, you would have to enter a payment transaction in QuickBooks that closes out the invoice. If you are using accrual basis accounting the invoice itself represents income since accrual accounting considers income to occur at the moment the service has been rendered or the products change hands, which in the case of eCommerce would likely mean changing hands from your company to the shipping vendor. Lastly, a sales receipt documents that both the products and the money have already changed hands. It avoids the distinction between cash and accrual accounting because the money has already changed hands. Generally with eCommerce this is actually the case. By the time the product changes hands, or within a few minutes of doing so, a credit card is charged and payment has been made. For this reason, sales receipts are usually the best fit for eCommerce transactions. The last of the three issues addressed by this article is choosing how money flows between your accounts when a transaction is entered. The first thing to explain is what a QuickBooks transaction does. As discussed above, a sales order does not create any income, what an invoice does depends on whether your QuickBooks file is set up to use cash or accrual basis and a sales receipt always creates income. QuickBooks has to put this income somewhere. Sales receipts can be entered either with or without payment items. If you do not include payment items, the balance at the bottom will indicate the total amount due for the order and it is assumed that you received from the customer the amount that was due. When you use this method, the income from the order will always be placed into a special account called “Undeposited Funds”. This is a fitting place for the funds to be placed since normally funds received from your customers via credit card transactions are first transferred to your merchant account and then batched together and daily, weekly or bi-weekly deposited into an account. You can adjust what account the income is deposited into. This is done when you create the payment item in QuickBooks. You have the option to either “Group [income received with this payment item] with other undeposited fund” or specify an account to directly deposit the income to. It is generally recommended to send income from transactions into undeposited funds. That will be discussed later. You can document exact transactions from your customer. For example, perhaps the customer ordered two items and one of them was backordered; you charged part of the order on one date and part on another date. In this case, you could add two line items: one for the first charge and another for the second one. When using invoices to document orders when payment items are not included in the transaction you have to generate a separate object to document when payment is received – a payment object. QuickBooks keeps track of the amount due from each customer and when you go to enter a payment it will show the amount due and ask which invoices that payment was meant to settle. Once you have received payments equaling the amount due for that invoice, the invoice gets marked with “Paid” across the top. 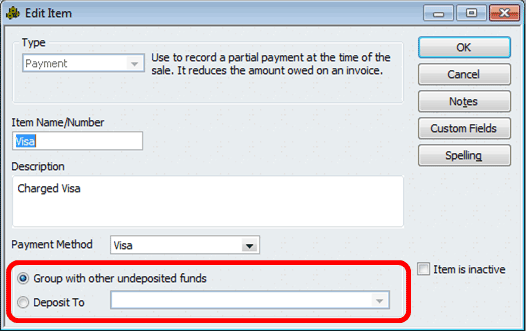 Payment items can also be included on an invoice transaction in QuickBooks. When that approach is used invoices work pretty much identically to sales receipts as explained above. If you have payments in undeposited funds this will automatically bring up a list of undeposited payments: If this screen does not automatically come up you can press the “Payments” button to bring it up. Just put a checkmark next to each payment included in this batch and click “Ok”. 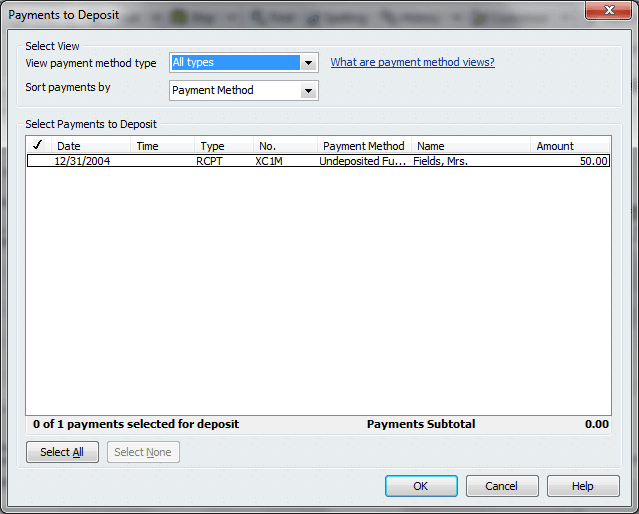 QuickBooks will add a line item for each payment you selected on the “Payments to Deposit” screen. You can also add additional line items to the deposit to reflect merchant fees or other adjustments your merchant account makes. Once you save the deposit, you will see that the payments you selected on this deposit will no longer appear on the list of “Payments to Deposit” for subsequent deposits you make and a new entry will be added in the bank account you deposited it to reflecting the amount added to your account. Entering all the data from your online store into QuickBooks is quite a chore. It can consume hours of your time transfering customer names, addresses and items from your store into QuickBooks. Fortunately there is software that is specifically designed to alleviate this workload. The SuperManager order management software integrates with QuickBooks using Intuit’s only approved mechanism: the QuickBooks SDK. It will transfer either order or merchant batch data into your QuickBooks database with you only having to go through a little setup and then doing a single mouse click to transfer a group of orders into QuickBooks. If entering online orders into QuickBooks is the only thing you are looking for, you can buy the special edition for QuickBooks, which currently sells for only $149. You can easily spend that much in labor, or worse yet, your own time, just in manually entering a couple days’ worth of orders. Save time and money and invest in The SuperManager. Do you have a special setup or some detailed questions? Fortunately there are also professionals out there that specialize in this! Roxanne Brown is a QuickBooks Pro Advisor and one of the few in the industry that focusses specifically on the world of eCommerce. She has assisted countless other online retailers and can help you get started with tracking your online business in QuickBooks.